// i was in the festival of photography in rome and a young photographer, luca, was involved in the organization. one of the key things they do at this festival is that they invite a photographer to make a body of work on the area and then show it as part of the festival. so luca gave me a lift on the back of his scooter- which is the only way to see rome by the way! he told me he wanted to apply the idea of the festival to his hometown of lugo and asked if i would be interested in taking part. i said absolutely. my philosophy with these things is to always say yes and then figure it out later! // i’m always wary that a lot of the work i do in ireland would have a political or socio-historical connection to ireland. i kind of loathe doing that when i go somewhere else, because i’m not from there and i’m not embedded enough in the culture. after a couple of conversations [about the project] with luca, nothing was really emerging, so i decided i would just hit the ground running and see what happened. originally when luca started to talk about this village in the north of italy, i immediately saw hills and mountains and cows with bells and women with scarves! in reality, lugo is flat, completely flat… and then there was the fog, which is very typical of that region. // the first morning i did what i usually do, which is got up early and just walked the streets. i walked around, looking, and there was a beautiful blue sky at half eight in the morning. at half nine i was in the piazza and suddenly a mist rolled in out of nowhere. 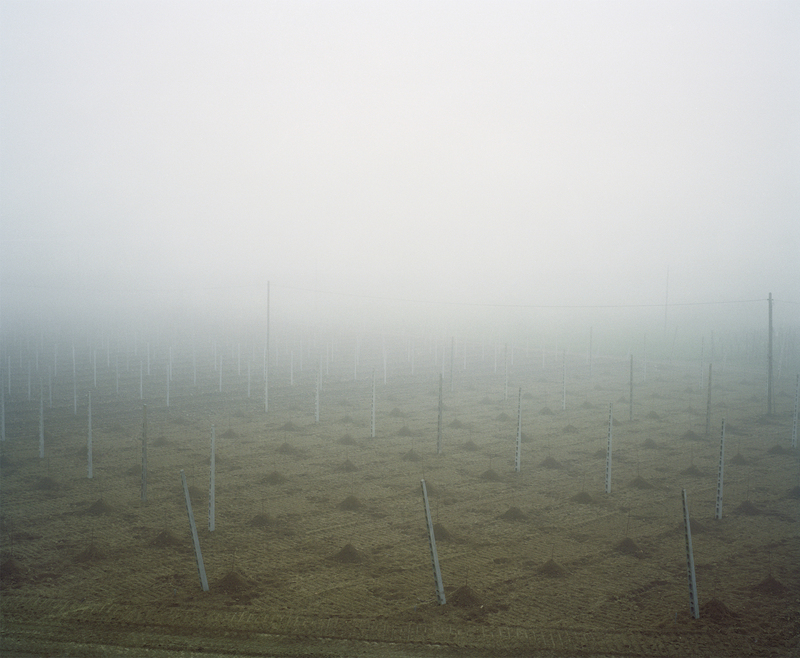 it then sat on the landscape for about eight days and the whole project then became about the fog. // it’s funny the whole fog thing – it’s called nebbia in italian – it’s quite pervasive even in their [the locals] psychology. 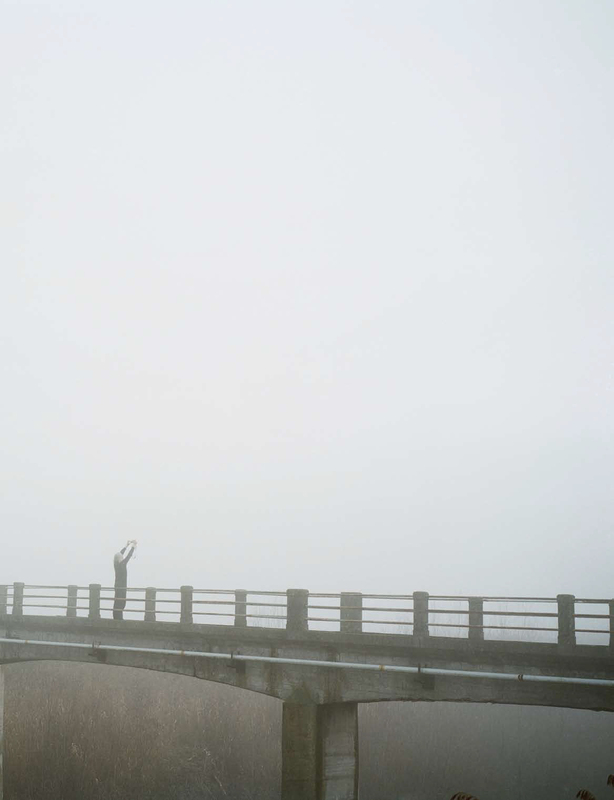 this fog that can sit for eight or ten days, it’s a very strange feeling, very apocalyptic. i think i had just read cormac mccarthy’s the road, and it had that vibe that some sort of apocalyptic event had happened and people were moving away to try and find a way to safety. it also reminded me of a film by michael haneke called time of the wolf. it’s a very feral, raw type of movie. i made a connection with that because very often luca and i would go out into the landscape and we might see two people all day. it was really eerie and spooky. // i used a beckett quote within the book that ‘when a man in a forest thinks he’s going in a straight line, in reality, he’s going in a circle. i did my best to go in a circle, hoping in this way to go in a straight line. and if i did not go in a rigorously straight line, with my system of going in a circle, at least i did not go in a circle, and that was something’. so my plan was to go in a circle. that was the joke about getting lost in the fog and not really knowing where or who you are and what it does to your head. generally, i spend years – aeons – refining a body of work. but in this case, i spent twelve days photographing and then literally came back and started to edit. it was great working within a specific amount of time; it had a nice intensity to it. i just had to go out every day and hunt and scour for pictures. i’ve been back to lugo many times since and each time it has looked and felt different. but i have often asked myself; what would i have done if it had been sunny during my time shooting there because it’s just so different. // before i went to lugo i had been experimenting with self-portraits in the landscape. when i got there i felt that it was the place to really do this. one of the problems i had before was that there was a limit to how far i could go into the landscape. whereas in lugo i had luca with me so i could set up the picture and then go as far as i liked. i could become this little dot if necessary. this interaction of the landscape pictures played against pictures of me in the landscape opened out the whole process. there’s a loose joke that photographers are considered to be heroic, where they go out and take on the world – you know, the brave man who brings back pictures from the world. one of the things i liked about being able to go so far [into the landscape] is that really i’m just this tiny little thin man, standing in a vast space. so i’m not so important after all and the landscape is much bigger than i am and always will be. // the primary goal of this project was to produce a book so it wasn’t just about an exhibition. 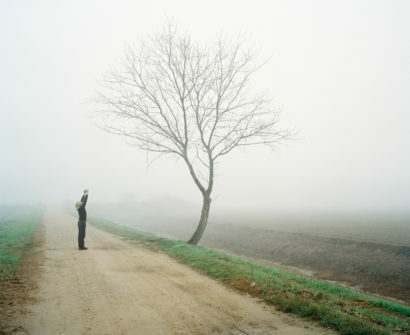 the cover of the book is actually a picture of luca, out with me as this solitary figure walking down this road. i was also thinking that this man walking around inside the book is trying to follow the figure on the cover and maybe, he’s ultimately following and trying to find himself. // there is a tradition of photography specific to this region and the photographer luigi ghirri did a similar project in that area with an italian writer. ghirri took a picture of the writer walking along a bank and the picture is almost identical to mine. it’s really spooky as i hadn’t seen the image before in any way – they’re almost twins, it’s just uncanny. 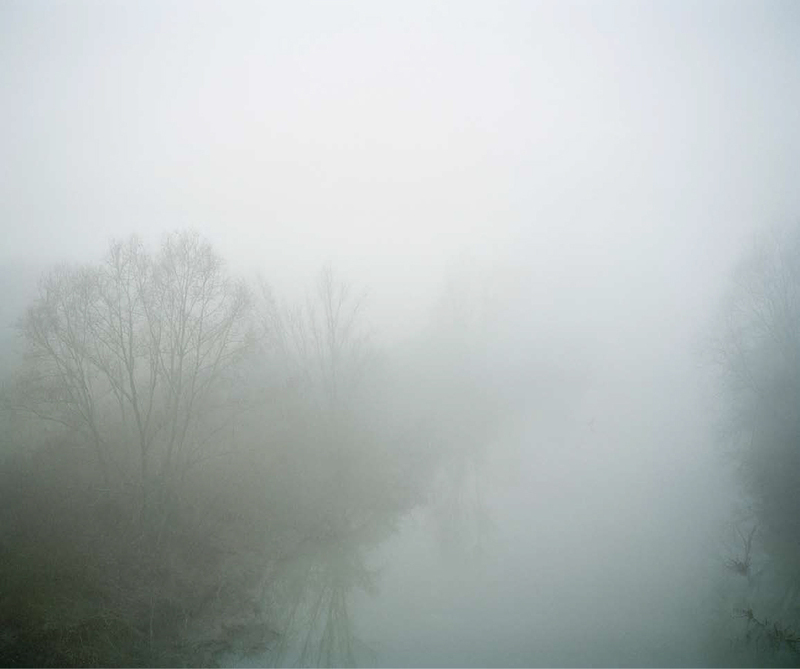 // the title of the book is taken from an italian poem entitled in the fog by giovanni pascoli. my dearly beloved gogo sourced it for me. i wanted something that would be relevant and then when i read the ‘neither near nor far away’ i thought that it was perfect. it suits the project so well so i poached that line for the title, because otherwise i was kind of stuck! // i would always try to have a definite thought process behind the work, but for me what’s more important is the emotional engagement. it’s that combination, but the emotion definitely is the more important thing for me, that it touches someone; it grabs them and affects someone in some way. when i was walking in those places it was such a strange feeling. it really felt like you were the last two people in the world. several people in lugo said to me if anyone ever asked them where they were from that they would show them the book. i took this as being the biggest compliment from the project. the sequences of images just reflect what it’s like to live there. // i’ve used maps before, in innocent landscapes for example. they were often misunderstood [in that project] in that they were my markings on my roadmaps to help me remember where i had gone. some people think they’re official maps, but that’s okay because maps are supposed to provide information. so when i went to lugo i thought it would be a good way of engaging with local people. i would ask them if there was anywhere they thought might be interesting, and they would draw me a map. i was interested in the way that the local people would sketch out their idea of the landscape. what’s interesting about the maps is that the psychology of each person who drew them is very different. some of them are very precise but some of them are just a simple line. i liked that idea of engaging and then again it’s this little joke that the maps are useless anyway because unless you’re a local they don’t really help you get anywhere. again it’s this thing with the fog and the uncertainty. maps are supposed to be definite and to guide you so that idea was floating around in my head; the uselessness and the usefulness of maps. // with innocent landscapes trying to find places was initially really difficult. they were tiny little places in the middle of nowhere. if you look at them they’re very often maps that you could only use if you were a local. that’s also about trying to get a local knowledge about what happened there. i remember being brought to the first site and what i felt that night in that place was so strong. there was nobody but the way the landscape had been churned over and violated was a very basic metaphor for what had happened to these people. one of the key things with innocent landscapes is all the victims were from the north of ireland but they were taken south – probably interrogated, then killed and buried in the south. // what i discovered is that a landscape can be, simply, a landscape. but it’s also a landscape that has layers of history and stories and narratives that have gone before it and they all shape and form the landscape in one way or another. for example the cruising project close encounters happened because i had inherited a dog and began walking her in a particular place at certain times of the day. i began to notice that this cruising was taking place in the daytime. i started to look at the landscape and what was happening to it because of this. i followed the tracks into bushes, but then the bushes opened out inside as a result of people having been there. the whole notion of following tracks into the landscape became very interesting to me. that’s how the amore project came about. i was in italy one summer and i was close to a large pine forest. i figured there was bound to be cruising in the area and i went to look for that. but as it happened the major thing in that area was prostitution which opened up a whole other project. // for me i love work that’s like a journey of discovery; not only in the work itself but also personally and then just figuring it out as you go along. i would never like to know in advance what i’m going to do, because, why do it then? if that’s the case then there’s no discovery. that for me is a very important part of the process, discovery about something but also more so about myself.